Magazines titled A-G, (24 articles),see below, and includes Geographical etc. Magazines titled H-M, (38 articles) eg Marie Claire etc. 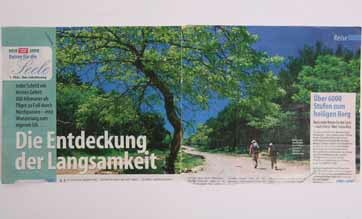 Magazines titled N-Z (30 articles) eg National Geographic Traveler etc. A couple of my photo portfolios on Varanasi, and Sunset Silhouettes both in INDIA published in this well respected, and generally regarded, Japan's leading photography magazine. 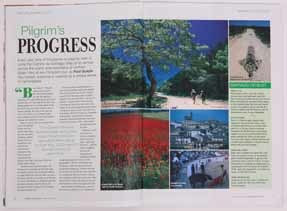 Double-page spread on Hiroshima, JAPAN using my photographs ran in this well respected Time-Warner Inc (HONG KONG) publication. 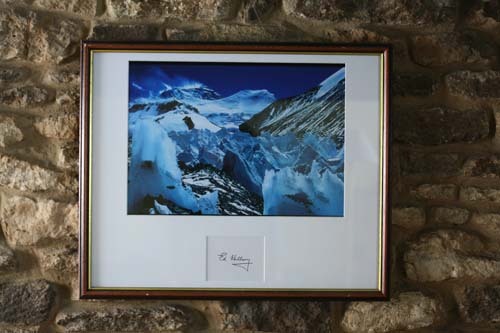 Seven page feature using my photos and my text on Mount Kailash the world's most sacred mountain in remote western TIBET. My sumo wrestling, JAPAN feature using my photographs ran over several pages in TALKIES MAGAZINE, a very large in size publication, (a double page spread measures 20inches across). BIZARRE magazine (UK).Huge sculpture made of snow appeared as a double-page spread (dps). My photo taken at Sapporo Snow Festival, Hokkaido Prefecture, JAPAN. CANON CHRONICLE magazine (JAPAN). 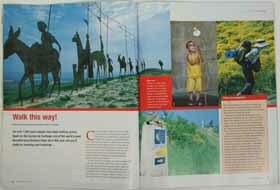 My Moscow, RUSSIA portfolio in Canon's own magazine for and by Canon camera users. CANON CHRONICLE magazine (JAPAN) double-page portfolio spread of my images of Faces of INDIA. CANON CHRONICLE magazine (JAPAN) double-page portfolio spread of my images of Varanasi, the Eternal City on the banks of the River Ganges, INDIA. COLORS magazine, the quarterly publication of Benetton(Italy). Double Page Spread of my photograph of this parade/festival in Yamaguchi Prefecture, JAPAN. Double-page spread of my photograph of tug-of-war held at Sports Day at a school in Hiroshima, JAPAN. Development magazine published my photo of Anti WTO grafitti photo taken in Zagreb, CROATIA. DHL COURIER My feature on Buddha's Birthday celebrations in KOREA was used by this company. 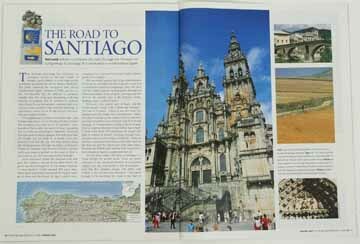 EVERYTHING SPAIN MAGAZINE(UK) TRAVEL|PROPERTY My camino pilgrimage to Santiago feature ran over several pages in this magazine. I walked from the French border to Galicia across northern Spain over a five week period. GEO (KOREA) MAGAZINE.One of the world's most respected publications used my photos over several pages on a feature on the Eden Project, the huge eco-glasshouses project in Cornwall, ENGLAND. GEOGRAPHICAL (UK) Several page culture feature that ran in this magazine of the Royal Geographical Society.Photos from Fertility Festival /Procession through streets of small town in JAPAN. 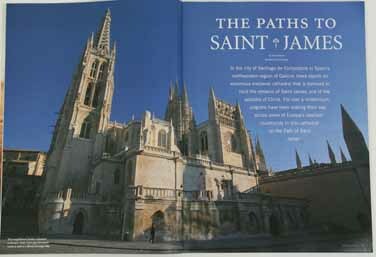 GEOGRAPHICAL (UK) Several pages feature of my photographs on the pilgrimage to Santiago, Galicia across northern SPAIN. Eight-page feature using my text and photography on rice productionproduction throughout the year. Article subtitled rice cycle it covered an in-depth report on planting, harvesting and festivals related to rice in JAPAN. Full page spread with all of my photos and translated text on my feature "Using Ones Head" in INDIA. 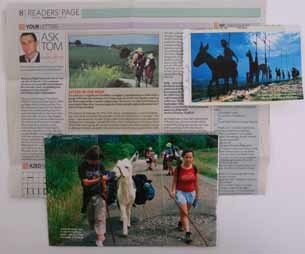 Stock shot of Camino to Santiago de Compostela, a pilgrimage across northern SPAIN to Santiago in Galicia.